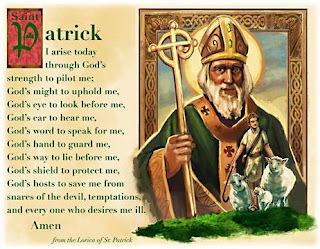 St. Patrick (Pātricius, according to his own writings) was a 5th century Bishop and missionary, known as "the Apostle of Ireland", although he wasn't Irish himself, but most likely Scottish. His father was a deacon and his grandfather a priest. At the age of 16, and an unbeliever, Patrick was captured and enslaved for six years by a group of Irish pirates, working as a shepherd. It was during this time that he called upon the Lord and was told by God that he would soon return home. After accepting Christ, he escaped slavery and, after various struggles, made it home. After a few years of study, he had a vision that led him back to Ireland as a missionary, preaching to the very people that had enslaved him years before and baptizing thousands, converting the poor and wealthy alike, including sons of Irish kings. He never accepted payment or gifts for his work which put him outside the 'norm'. With no legal protection, he was often received with ridicule and insult. He was arrested, beaten, and awaited execution on several occasions but persisted in his mission of spreading the Gospel. After 40 years of living in poverty, teaching, traveling and working tirelessly, Patrick died on March 17, 461 in Saul, where he had built his first church. I wanted to share this prayer, written by Patrick in 433 A.D. for divine protection before successfully converting the Irish King Leoghaire and his subjects from paganism to Christianity.